We’re supposed to be making cuts, but the latest United Nations climate figures show that greenhouse gas emissions have risen by more than 2% in developed countries since 2000. Ex-Soviet bloc countries were responsible for much of the rise (up 7.4%), mainly due to increased development in Eastern Europe coupled with outdated and ineffecient industrial plants. Canada’s laughable efforts at a promised cut of 6% since 1990 levels were also shown up by the new report: its emissions rose by more than 21% in that time. As one of the world’s richest countries, with enviable resources and opportunities for renewable energy production, Canada has no excuse for performing this lamentably. Canadians were one of the original driving forces negotiating the Kyoto Protocol in 1997. But its backwards slide into climate apathy culminated eventually in Stephen Harper’s government taking the socially unacceptable stance of the US and Australian outliers at international climate talks in Bali in 2007 – effectively withdrawing the country from committing to emissions targets. 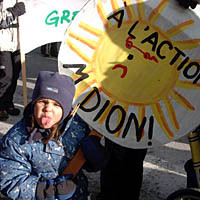 Canadians had a chance at elections in October to reverse this trend, and for a while it looked as though the electorate would choose Liberal candidate Stephane Dion on environmental grounds. It was not to be. Harper was elected on what I believe to be a misguided economic agenda: in not reducing emissions, the country is taking a big financial gamble that could end up costing it dearly. While signees are emitting legally through the carbon market, it remains an illegal emitter. Australians under their new leadership have ratified Kyoto, the US looks likely to come onboard under Obama – what will Canada do? If Canada does take real steps towards reducing its carbon emissions, it will be a fascinating turning point for humanity because it will, I think, represent the first true example of climate altruism. Canada is the only country predicted to benefit wholesale from the effects of climate change. Other countries such as Russia and the UK will see some upsides, but the forecast for Canada is largely rosy. Will it feel a compulsion to act anyway to save the world? What would you do if you were a human Canadian?